Happy Tuesday everyone! Time has been flying and we’re already at the 3/4 mark in our #Summer10x10 Challenge. It’s been great to see some deeper insights about how well your 10 items have worked so far, how you’re feeling about personal style and how you’re shaking things up! Check out all the honest takeaways (my favourite part) on the hashtag if you need some style inspo for the week ahead and meet some downright delightful folks while you’re at it. Plus, if you’re keen on giving the 10×10 Challenge a go you’re welcome to start now! Everyone is going at their own pace and you can get all the info you need right here. My challenge co-host (and blogger bestie) Caroline of UnFancy and I are both on outfit #7 today and this is usually when I start hitting roadblocks within my options. In the past, at this point I’ve often felt anxious and a little stifled but that creative constraint is usually what leads to a new outfit I either love or try but never wear again. In today’s case it’s definitely the former and I’m SO happy I decided to go ahead with this one even though it’s not super ‘summery’. You know I love an all black look so here’s how I’m attempting to pull it off for summer! TEMPERATURE – High of 28º C with a mix of sun and clouds. ACTIVITIES – Morning in the office, lunch out with a friend and an afternoon back in the studio. Then an open house tour and dinner with the fella. INITIAL THOUGHTS – Shortly after I’d pulled my 10×10 items and started trying pieces on this look came together. Immediately I LOVED it but was worried it was too dark for Summer. Then I saw this photo on one of my favourite vintage instagram accounts and was suddenly convinced that I needed to give it a go. So here we are today, and this may very well be my favourite look yet! Also, how did I manage to not wear this tank all last week? Trust me, I’ll be making up for it. I love how these two pieces almost look like a jumpsuit when worn this way. It feels very minimal, clean and chic, not to mention super comfortable too. It’s one of those timeless combos that can be worn so many different ways and will always feel sophisticated. Hello new favourite set! 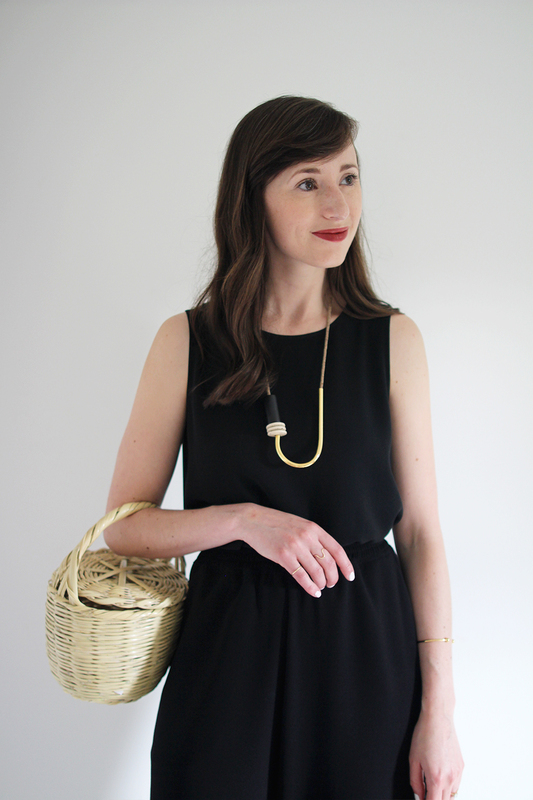 To steer this all black base into more Summer friendly territory I opted for my flat sandals to keep it a bit more casual, then I grabbed a wicker basket because few accessories say ‘summer’ more than a vintage basket. Finally, I added a fun necklace, a couple of gold rings and a bangle to finish it off. Now I’m ready for all the good things this day has in store! Plus, I’m already plotting how/when I can wear this set again asap. 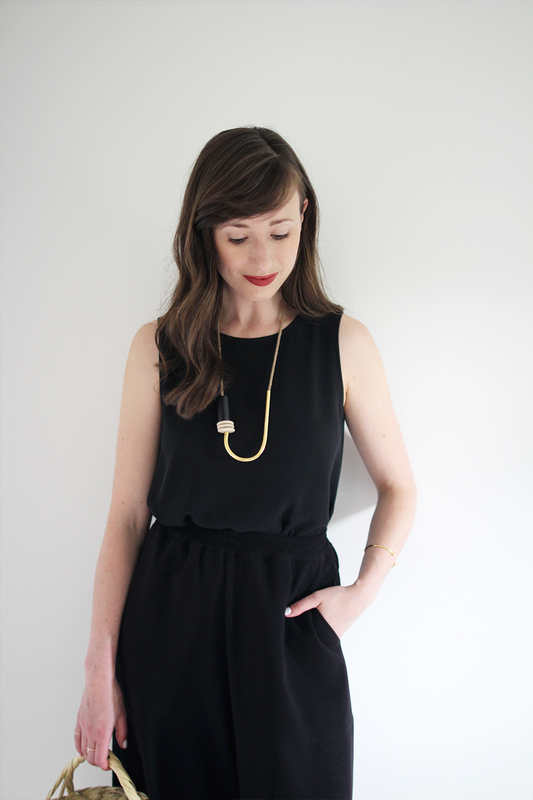 1 | FAUX JUMPSUIT | I love this super simple trick to creating the illusion of a one-piece. Just by putting together a top and pant in the same colour and a similar material, suddenly you can have a whole new item in your closet. If you’d like to try creating a faux jumpsuit for yourself look for two items with simple cuts, in the same colour and material. Tuck the top into your pants and you’re all set! 2 | SOFTEN UP | An all black base is obviously a bit heavy for the summer but if you’re like me and can’t help yourself then there are a couple easy ways to keep it feeling apropo for the season. Add natural textures like a woven bag which add an easygoing, vacation vibe. Wear flat sandals with an open, minimal design to let those toes out! Bare some skin without going overboard by ditching the sleeves and hiking up the hemlines to a culotte or cropped length. Lastly, an easy way to keep it feeling relaxed is to opt for a soft hair style with an air dried, beachy wave look or a loose curl if you want to keep it sleek. A low, loose bun could also do the trick! 3 | HIGH WAIST = LONG LEG | This silhouette is working especially well because of how the high, fitted waist on these pants contrasts the loose fit of the tank and the wide shape of the pant. This has a very slimming effect on the mid-section. Plus when you create a high visual mid-point you in turn create the illusion of a long leg. Even with an odd length like these culottes. This is one of the oldest tricks in my style book and it’s never failed me yet. You don’t have to wear fitted pieces to achieve a slimming look. Instead pick pieces with a bit of volume in materials with ample movement (ie: silk, tencel, viscose, jersey) and pick a bottom that will sit fitted on your natural waist. This volume vs. fitted contrast creates a slim midsection and the high waist gives you legs for days. Win, Win, Win! Today’s spotlight will be a little different because these pants are no longer available but I’ll tell you how they went from the sell ’em pile to the love ’em section in my closet after some wear testing and one small tweak. Plus, I’ve found a few similar options worth checking out! So, I got these pants at a mega discount during one of Jesse Kamm’s end of season sample sales after lusting over them for a good 6 months. I was so stoked to get them but after they arrived in February I just wasn’t sure they were right. Honestly, until not long before this challenge I’d had them in the ‘sell’ pile. I really just wasn’t sure about the length (you know I love my ankle crops) and whenever I tried wearing them during the cooler months they would get so staticky that I just couldn’t stand it. But something kept me from parting with them and once the weather warmed up I decided to give them another look. Out of the box they were too big in the waist and once I came to terms with the fact that I didn’t want to wear them low I had them taken in to sit at my natural waist. Ten dollars and a visit to my tailor later they felt so much better and much more ‘me’. Then I started wearing them for short periods around the house, walking Dobby and out to run quick errands here and there. During which time I noticed they weren’t getting staticky any more. At least the humidity is good for something, right? Plus I found them really comfortable and not too hot. Finally, after a long Netflix evening on the couch, spent crumpled under a blanket and cradling a shedding corgi I got up to see they had not one single wrinkle or dog hair on them. How could this be? Well, I’m chalking it up to a semi-magical Japanese Rayon Crepe (ie: poly/rayon blend) and other than that it beats me! To this day no matter how much I’ve sat in them or how long they’ve been in a heap on the floor they just don’t wrinkle or collect fur/lint (well other than the odd strand). I know poly blends are the worst for the environment, but it’s pretty incredible from a crease standpoint compared to the cotton canvas and linens I’m always living in. In the end, after giving them a real shot, I discovered that they: are super comfy (when there’s no static build-up), don’t wrinkle, have a cool cut, have functional pockets and dog hair miraculously avoids them. Plus, I’ve found they’re a great alternative to shorts, skirts and totally work appropriate for client meetings. So yeah, it’s safe to say they’ve since been permanently removed from the ‘sell’ pile. Essentially, the moral of the story is that if I’d had given up on these pants the moment I’d wanted to, I would have missed out on a real warm weather wardrobe workhorse (say that five times fast). If you’ve got a piece you’re not ready to part with but aren’t sure you like, give it some more wear testing and consider the pros and cons or if any alterations could make a worthwhile difference! 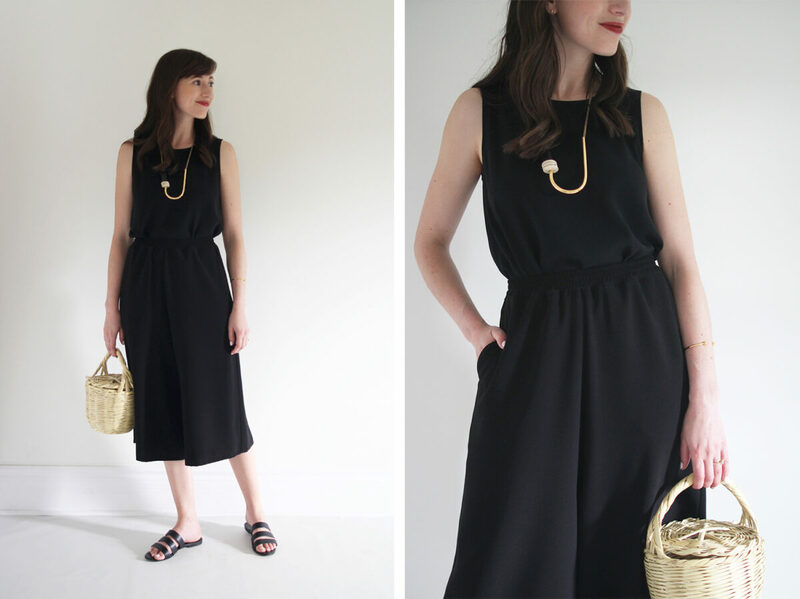 Here are some similar black culottes options I’ve discovered. All responsibly produced. 1 | BRASS CULOTTE | $82 USD | Made responsibly in China. | Longer inseam than mine which will be more flattering on most. 2 | EVERLANE COTTON POPLIN CULOTTE | $68 USD | Made responsibly in China. | Also available in Navy. 3 | EVERLANE WIDE LEG CROP | $68 USD | Made responsibly in China. | A crowd favourite. See my comparison with the Kamm Pant here. JUST THREE LOOKS LEFT IN THE #SUMMER10x10! SEE YOU TOMORROW OUTFIT #8! HOW ARE YOU DOING AT THIS POINT IN THE CHALLENGE? HITTING ANY STYLE ROADBLOCKS OR STILL BRIMMING WITH OUTFIT IDEAS? AS ALWAYS, I’D LOVE TO KNOW! 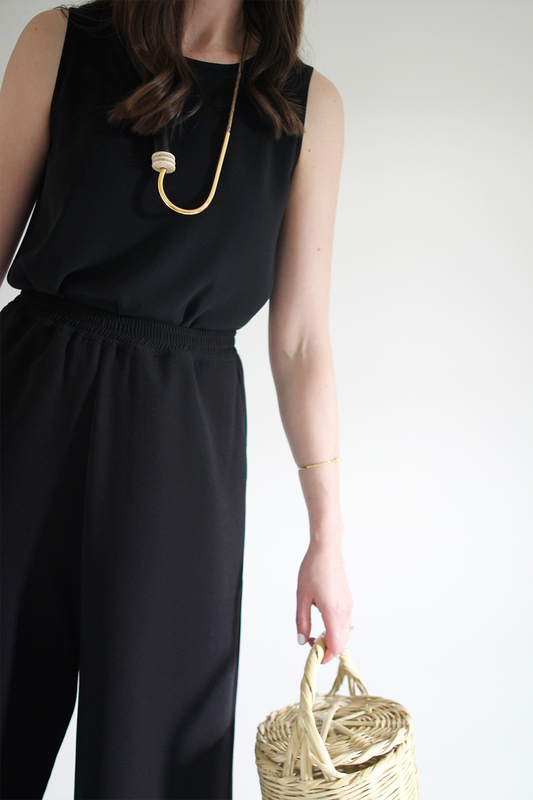 2 | BLACK CULOTTES | JESSE KAMM | s/o | Similar by EILEEN FISHER ($168 USD) by EVERLANE ($68 USD) and these from BRASS ($82 USD) look awesome! | Also, the Wide Leg Crop just got a restock. 3 | CAMILLA SLIDE | NISOLO via GARMENTORY | $88 $53 USD On Sale and almost sold out. | I wear a 7 | Made responsibly in Mexico | Save $20 OFF your first order when you sign up here. | Similar option here in 4 colours for $88 USD, made responsibly. 4 | BASKET | Le Birkin Basket | $120 USD | Handmade in Portugal | I have the size Small. Similar option also Available on ETSY for less in the size shown. That EF boxy shell is a true wardrobe workhorse for me! I wear the same size as you and now, over time and with some sales luck, have four boxy shells – two silk and two linen. It truly is the best. I would love to see how the length of this top compares to the length of the Petra. I have a larger bust and am always wary of cropped length tops. Thanks! Hi Stephanie! That’s awesome! It really is such a great staple piece. I measured both from shoulder to hem and the Petra is 17 in and the EF Shell is 21 in. Hope that helps! I love this outfit, especially the details! This is so cute <3 I love how simple and wearable it is. This is also such a good challenge. I'll definetly give it a shot. I wasn’t going to buy the Camillas because I just bought a similar two-strap slide, but then I got the email from Nisolo yesterday about their sale and these were included! I couldn’t pass it up. 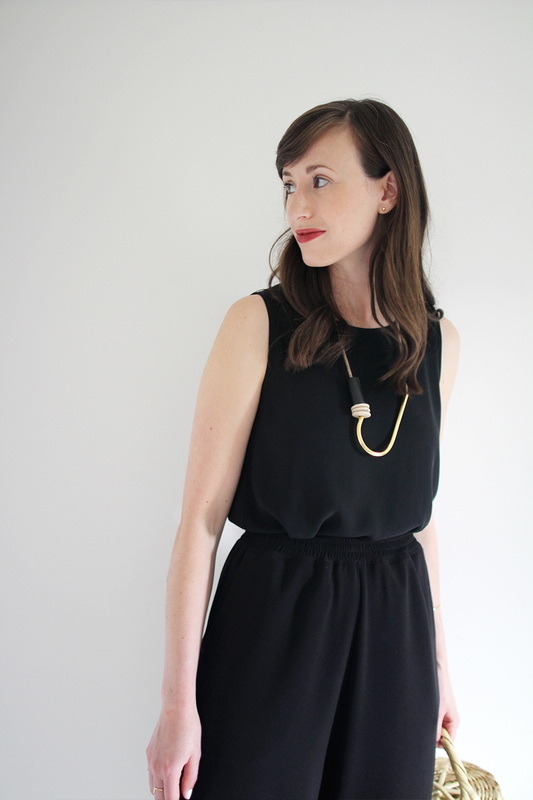 I think I love the idea of a “faux” jumpsuit more than a real one. Two pieces = more versatility (and lets just say it – makes it easier to hit the ladies room). Nice job on this look!